Bring on the dancing chihuahuas! I’m adopted, and I’m thoroughly convinced that the roving weinermobile is my birthfather. THAT put some weird pictures in my head. Me too. 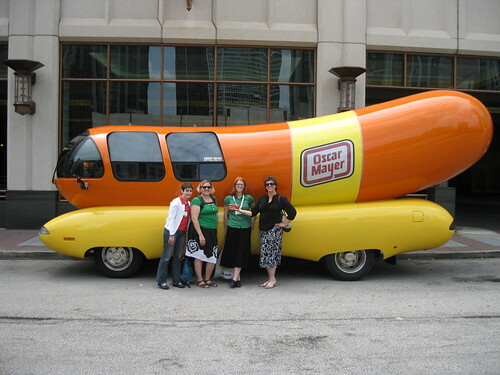 Those Wienermobile people were so nice & I love the colors in the photo, too. Just like Suzanne, I’m very happy to be in this picture! Aw, Mar. I wish you could be, but some years it is not meant to happen. Next year in…where? I’m hoping for New Orleans or Philly, 2 places I haven’t been but would love to see with you. I’ve been to both & would love it to be either of those! I want one of these. Can we get a right-hand drive? I think I would be dangerous driving one…they are pretty dang huge. But fun.